Before I joined Showdown, I was scared of everything. Everything! Like having to talk to people, what people thought of me, how I looked, I was scared of the crowd….I didn’t want to be the girl who sat in the corner with no one noticing me…but I was. I was the girl who felt awkward, out of place, invisible. No one talked to me. I don’t know why. Maybe it’s because of my age. People say I’m too young and innocent. I don’t really know what they mean. My whole experience in Showdown had been like a fairy tale. From the auditions to the Meltdown (where of all time and place, I had to have chickenpox!) to being selected to be in the Top 12. Top 12! That’s not bad for a innocent first timer! That was so awesome! I couldn’t believe that we could get through the Meltdown alive. But we did! And I survived my chickenpox! Luckily we had a few weeks before the live shows began. That gave us time to prepare ourselves, and for my spots to heal! 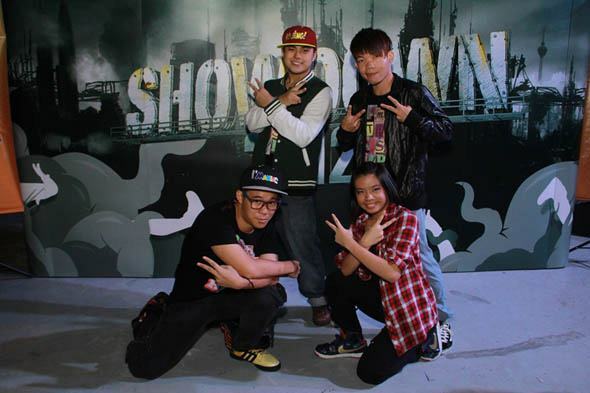 But I couldn’t wait for the finals at KL Live and when it finally came, what an experience that was, performing to a live audience in front of Maple Loo and Joe Flizzow, and shown live on 8tv! I was so nervous!!! For our first performance we danced to Blackout which we used water bottles to represent freshness and energy. We did an ok performance and the judges quite liked it. But they wanted to see more from us and told us to use the stage to our advantage. When the time came for the judges to announce which group was to be kicked out, everyone was so nervous! There was suspense in the air. We held our breaths. And the verdict was…. No one was going home that night! What a relief! Some of them cried tears of relief for being able to stay on. I was happy we didn’t get kicked out. For the next performance we were given the 90’s period which was hip hop, our element! We were overjoyed to have that because we were confident we could do a great job. And we did. The judges said we were the only crew that night to do our homework well and we delivered! We gave the best performance that night. We were very happy! My grandma came to support me, all the way from Seremban. Thank you grandma! For the third week of the finals, we had Goldfish & Blink to mix the music for us. How awesome is that! But the chosen music was not quite our style. I couldn’t get it because it was not the kind of music that I am used to dancing to. This was club music and we don’t do that kind of dancing. So…yeah, the music was wrong and the choreo….well, let me just say that I felt really strange trying to dance to it. I didn’t feel myself at all! When we finished, the whole hall was quiet. Everyone was stunned. No one could believe that we could be that bad! Some of our supporters cried for us even before we finished dancing. But I knew from the start of the week we were going to be sent home that night. I pknew what the judges would say – that ours was the worst performance that night. But no one listened. No one believed me. No one knew what I knew. Most of all, I will miss the stage where I feel on top of the world, dancing my heart out. I am thankful for the opportunity to dance here. I want to thank the 8tv crew for pushing me to talk, to overcome my shyness and to be myself. They are really friendly! I want to thank all our supporters who voted for us – you are amazing! Thank you for believing in us! So, the fairytale has ended for me. It was fun while it lasted. Who knows? Perhaps I will join again next year! This entry was posted in Children Speaks. Bookmark the permalink.